The concept of Tax Deduction at Source (TDS) was there in the erstwhile VAT Laws. GST Law also mandates Tax Deduction at Source (TDS) vide Section 51 of the CGST/SGST Act 2017, Section 20 of the IGST Act, 2017 and Section 21 of the UTGST Act, 2017. GST Council in its 28th meeting held on 21.07.2018 recommended the introduction of TDS from 01.10.2018. 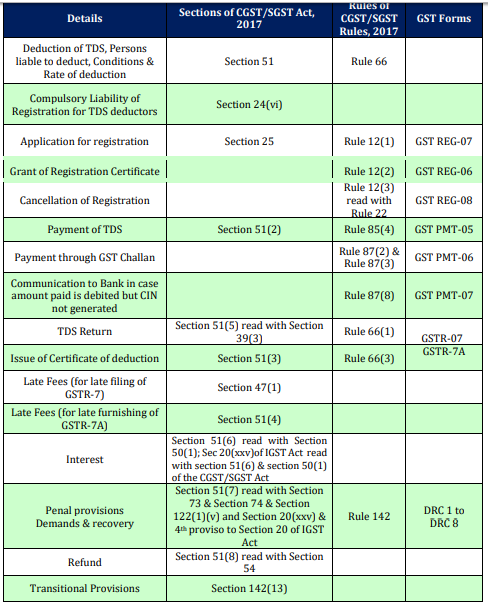 The procedures of TDS along with related legal provisions are discussed herein below for the understanding of the stakeholders including the Drawing and Disbursement Officers (DDOs) who are required to deduct tax in accordance with the provisions of the GST Laws. GST Laws provide for tax deduction at source (TDS) by the specified category of persons (herein after referred to as ‘the deductor’) from the payment made or credited to the supplier of taxable goods or services or both (herein after referred to as ‘the deductee’) at a prescribed rate. Notification No. 33/2017 – Central Tax dated 15.09.2017 was issued by the CBIC to enable registration of tax deductors. However, Government suspended the applicability of TDS till 30.09.2018. Now, it has been decided that the TDS provision would be made operative with effect from 01.10.2018. Notification No. 50/2018-Central Tax dated 13.09.2018 has already been issued in this regard by CBIC. Similar notifications have been issued by respective State Governments. Supply in GST covers both supply of goods as well as supply of services by vendors/suppliers to the Government Departments, local authorities and other recipients as listed in para 1 (a) to (f) above. Procurement of stationery items, toilet articles, towels, furniture, air-conditioning machines, electrical goods, books and periodicals & medicines, etc. Procurement of security services, car rental services, generator rental services, rental services like office building/land taken on rent, maintenance services, rental of machinery, etc. There may be supplies which are composite in nature i.e. taxable supplies of goods and services or both which are naturally bundled and supplied in conjunction with each other in the ordinary course of business [Section 2(30) refers]. Works Contract services such as road, bridge, building development / renovation / repairing / maintenance services involving supplies of both goods and services. Tax is required to be deducted from the payment made / credited to a supplier, if the total value of supply under a contract in respect of supply of taxable goods or services or both, exceeds Rs. 2,50,000/- (Rupees two lakh and fifty thousand). This value shall exclude the taxes leviable under GST (i.e. ‘Central tax’, ‘State tax’, ‘UT tax’, ‘Integrated tax’ & Cess). a. Total value of taxable supply > Rs.2.5 Lakh under a single contract. This value shall exclude taxes & cess leviable under GST. b. If the contract is made for both taxable supply and exempted supply, deduction will be made if the total value of taxable supply in the contract > Rs.2.5 Lakh. This value shall exclude taxes & cess leviable under GST. c. Where the location of the supplier and the place of supply are in the same State/UT, it is an intra-State supply and TDS @ 1% each under CGST Act and SGST/UTGST Act is to be deducted if the deductor is registered in that State or Union territory without legislature. d. Where the location of the supplier is in State A and the place of supply is in State or Union territory without legislature - B, it is an inter-State supply and TDS @ 2% under IGST Act is to be deducted if the deductor is registered in State or Union territory without legislature - B.
e. Where the location of the supplier is in State A and the place of supply is in State or Union territory without legislature B, it is an inter-State supply and TDS @ 2% under IGST Act is to be deducted if the deductor is registered in State A.
f. When advance is paid to a supplier on or after 01.10.2018 to a supplier for supply of taxable goods or services or both. a) Total value of taxable supply ≤ Rs. 2.5 Lakh under a contract. b) Contract value > Rs. 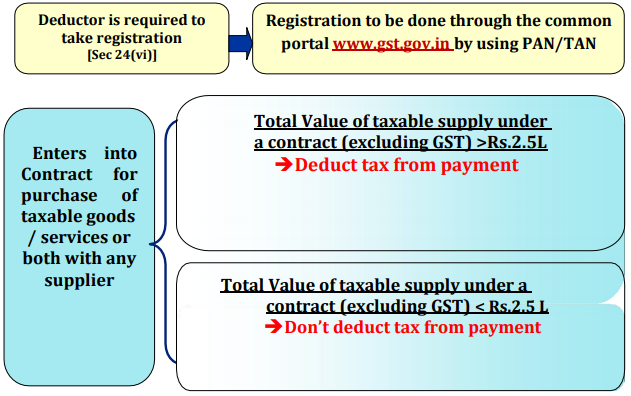 2.5 Lakh for both taxable supply and exempted supply, but the value of taxable supply under the said contract ≤ Rs. 2.5 Lakh. c) Receipt of services which are exempted. For example services exempted under notification No. 12/2017 – Central Tax (Rate) dated 28.06.2017 as amended from time to time. d) Receipt of goods which are exempted. For example goods exempted under notification No. 2/2017 – Central Tax (Rate) dated 28.06.2017 as amended from time to time. e) Goods on which GST is not leviable. For example petrol, diesel, petroleum crude, natural gas, aviation turbine fuel (ATF) and alcohol for human consumption. f) Where a supplier had issued an invoice for any sale of goods in respect of which tax was required to be deducted at source under the VAT Law before 01.07.2017, but where payment for such sale is made on or after 01.07.2017 [Section 142(13) refers]. g) Where the location of the supplier and place of supply is in a State(s)/UT(s) which is different from the State / UT where the deductor is registered. h) All activities or transactions specified in Schedule III of the CGST/SGST Acts 2017, irrespective of the value. i) Where the payment relates to a tax invoice that has been issued before 01.10.2018.
j) Where any amount was paid in advance prior to 01.10.2018 and the tax invoice has been issued on or after 01.10.18, to the extent of advance payment made before 01.10.2018.
k) Where the tax is to be paid on reverse charge by the recipient i.e. the deductee. l) Where the payment is made to an unregistered supplier. m) Where the payment relates to “Cess” component. Finance Department is making a payment of Rs.3 Lakh to a supplier of ‘printing & stationery’. Where the total contract value of taxable supply is more than Rs.2.5 Lakh deduction is mandatory. Education Department is making payment of Rs.5 Lakh to a supplier of ‘printed books and printed or illustrated post cards’ where payment for books is Rs.2 Lakh and Rs.3 Lakh is for other printed or illustrated post cards. Yes, deduction is required in respect of payment of Rs. 3 Lakh only i.e. for payment in respect of taxable supply. Books are exempted goods; no deduction is required in respect of supply of books. However, payment involving ‘printed or illustrated post cards’ is for supply of taxable goods and value of such supply is > Rs.2.5 Lakh; so deduction is required. Finance Department, is making payment of Rs.1.5 Lakh to a supplier of ‘car rental service’. Deduction is mandatory in case the total value of taxable supply under the contract > Rs.2.5 Lakh irrespective of the amount paid. However, if the total value of supply under a contract is < Rs.2.5 Lakh, deduction is not required. @18% on Rs.5 Lakh for such purchase. Deduction is required in case of inter-State supply and if the value of taxable supply under a contract exceeds Rs.2.5 Lakh. Fisheries Department is making a payment of Rs.10 Lakh to a contractor for supplying labour for digging a pond for the purpose of Fisheries. This supply of service is exempt in terms of Sl. No. 3 of notification No.12/2017 – Central Tax (Rate) dated 28.06.2017 and hence deduction is not required. Municipality is making payment of Rs.5 Lakh to a supplier in respect of cleaning of drains where the value of supply of goods is not more than 25% of the value of composite supply. This supply of service is exempt in terms of Sl. No. Government school is making a payment of Rs.3 Lakh to a supplier for supply of cooked food as mid-day meal under a scheme sponsored by Central/State Government. hence deduction is not required. Health Department is making payment of Rs.10 Lakh to a supplier for supply of Hearing Aids. This supply of goods is exempt in terms of Sl. No.142 of notification No. For the purpose of deduction of TDS, the value of supply shall exclude the taxes leviable under GST (i.e. ‘Central tax’, ‘State tax’, ‘UT tax’, ‘Integrated tax’ & Cess). Thus, no tax shall be deducted on ‘Central tax’, ‘State tax’, ‘UT tax’, ‘Integrated tax’ and cess component levied on supply. No deduction of tax and cess should also be made on the value of exempted goods or services or both even if the exempt and taxable supply are billed together. NOTE: Suppose three separate contracts for supply are given to M/S ABC by the Health Department of the Government of West Bengal and the value of taxable supply is below Rs.2.5 Lakh in case of each contract though their combined value is more than Rs.2.5 Lakh; in such case no deduction is required to be made since value of taxable supply in neither of the contract exceeds Rs. 2.5 Lakh. There are 4 types of taxes in GST – Integrated Tax (IGST), Central Tax (CGST) and State Tax (SGST) / Union territory Tax (UTGST). 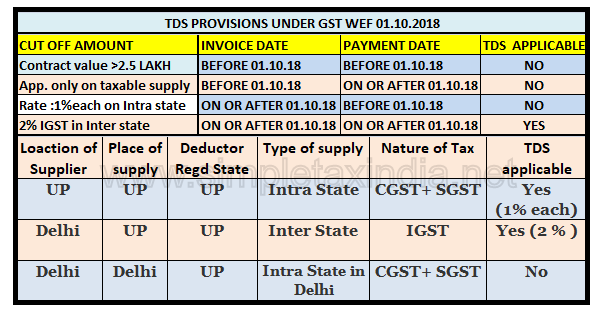 The deduction in case of intra-State supply (supply within a State) will be CGST & SGST (in case of Union territory without legislature, it will be CGST & UTGST), and the deduction in case of inter-State supply (supply from one State to another) will be IGST. Rate of such deduction is @ 2% [i.e. 1% each on CGST & SGST/UTGST component] on the amount paid/credited in respect of intra-State supply & @ 2% [as IGST] on the amount paid/credited in respect of inter-State supply. Rs. 10,000 (value of Supply) + Rs 900 (Central Tax) + Rs 900 (State Tax). Example 2: Supplier Y of Mumbai makes taxable supply worth Rs. 10,000/- & exempted supply worth Rs. 20,000/- in an invoice/bill of supply to Finance Deptt. of GoI located in New Delhi where contract for supply is for Rs.6,00,000/-(Rs.2,60,000 for taxable supply including GST and Rs.3,40,000 for exempted supply). The rate of GST is 18%. Following payment is being made by GoI to Y: Rs.10,000/- (value of taxable Supply) + Rs.1,800 (Integrated Tax) + Rs.20, 000/-(value of exempted Supply). Whether any deduction of tax is required? Since, the value of taxable supply in the contract does not exceed Rs.2.5 Lakh, deduction of tax is not required. Value of taxable supply under the contract is Rs.2, 55, 000/- which is more than Rs.2.5 Lakh and hence deduction of tax is required. (d) such persons or category of persons as may be notified by the Government on the recommendations of the Council. Development Board constituted under article 371 of the Constitution; or a Regional Council constituted under article 371A of the Constitution. By nature, the method of depositing TDS under GST is very much similar with the method followed for VAT efs payment in VAT. In GST, there will be a single portal www.gst.gov.in for registration, payment and filing of Returns. This section to be State-specific and to be written by the State concerned in accordance with the respective Treasury Management System. The Centre has already issued necessary instructions. The deductor has to generate a challan in the portal at www.gst.gov.in and deposit the tax so deducted through e-payment mode [Net Banking/Debit-Credit card/NEFT-RTGS] or OTC Mode [Cash/Cheque/DD]. For further details, circular No. 65/39/2018-DOR dated 14.09.2018 may be referred. can be done both through by using the offline tool. • In the offline method, the deductor would be required to fill up the designated .xl file and upload the said file with signature validation. • Tax deposited by challan would get credited in the electronic cash ledger of the deductor. The liability of a deductor in FORM GSTR 7 has to be paid by him by debiting his electronic cash ledger. • The deductor shall furnish to the deductee a system generated certificate in FORM GSTR 7A mentioning therein the contract value, rate of deduction, amount deducted, amount paid to the Government and other related particulars. The said certificate is to be furnished within five days of crediting the amount so deducted to the Government i.e. within five days of furnishing return in FORM GSTR-7. • The entire exercise has to be completed through www.gst.gov.in. • The deductee (i.e. the supplier) shall claim the credit of such deduction in his electronic cash ledger. The FORM GSTR-7 for a particular month has to be filed online within 10th of the month succeeding to the month in which deductions have been made. With the deduction of tax and submission of return in FORM GSTR 7 the amount deducted would be available in FORM GSTR 2A/4A of the registered deductee and the same would be credited in his electronic cash ledger. The deductee would be able to utilize this amount for discharging his tax liabilities. • The provision of late Fees in respect of TDS in the GST is a two-layered provision. • If the deductor fails to furnish the return in FORM GSTR-7 (under Section 39(3)) by the due date (i.e. within 10 days of the month succeeding the month in which deduction was made) he shall pay a late fee of Rs. 100/- per day under CGST Act & SGST/UTGST Act separately during which such failure continues subject to a maximum amount of Rs. 5000/- each under CGST Act & SGST/UTGST Act. • If any deductor fails to furnish the certificate of TDS deduction to the deductee [i.e. the supplier] within 5 days of crediting the amount so deducted to the Government (i.e. 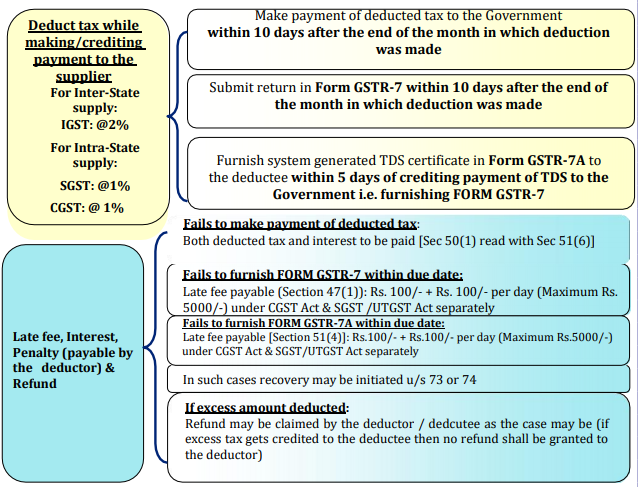 furnishing return in FORM GSTR-7), the deductor shall pay a late fee of Rs. 100/- per day under CGST Act & SGST/UTGST Act separately from the day after the expiry of five day period until the failure is rectified, subject to a maximum amount of Rs.5000/- each under CGST Act & SGST/UTGST Act. This information is really valuable. I have read various posts regarding GST but most of my questions weren't answered. Now all my queries are resolved.